Marcus Aurelius Claudius Quintillus Augustus was Roman Emperor for a few months in 270. 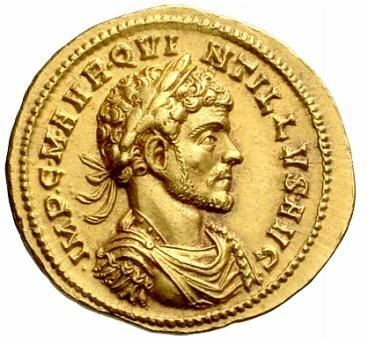 Originating from a low-born family, Quintillus came to prominence with the accession of his brother Claudius II Gothicus to the imperial throne in 268. He was declared emperor either by the Senate or by his brother’s soldiers upon the latter's death in 270. The few records of Quintillus' reign are contradictory. They disagree on the length of his reign, variously reported to have lasted as few as 17 days and as many as 177 days. Even his death is disputed; Historia Augusta reports him murdered by his own soldiers, Jerome reports him killed in conflict with Aurelian, and John of Antioch reports the cause as suicide. All agree that he died at Aquileia.